MTV just launched a new artist ranking service, based on velocity rather than popularity. Its aims: to shed the shackles of the Billboard charts, and take account of blogosphere buzz. 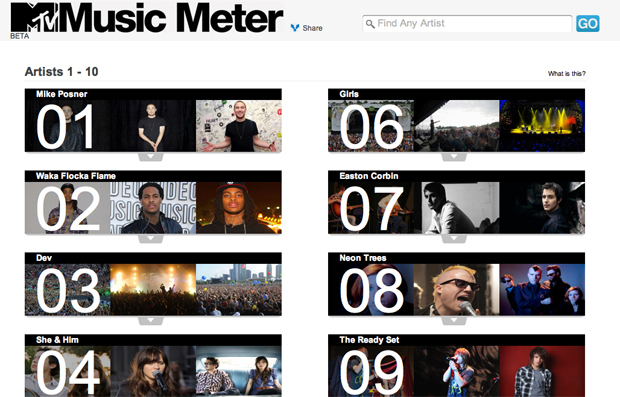 Today, MTV launches its Music Meter, a new artist ranking service aimed at upending traditional music charts. Rather than simply track CD sales (who buys those anymore?) and radio airplay, Music Meter ranks the top 100 artists bubbling up on a variety of non-traditional platforms. artists who are rising quickly–not those who are sitting in the No. 1 spot. Instead, users will find an eclectic mix of rising stars–those buzzing on the indie scene that have yet to go mainstream. 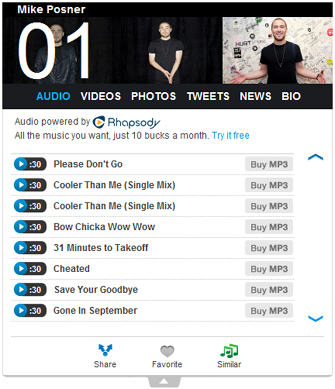 Each artist is featured in a widget-style box that provides news, tweets, videos and song previews and purchases via Rhapsody. world’s most active artists on social networking sites. But while the Ultimate Chart and Billboard are currently dominated by Rihanna and the Black Eyed Peas, MTV’s chart offers a refreshing list of artists: Waka Flocka Flame, Girls, Yelawolf.